California is a key leader in the $15 minimum wage struggle, but with a population of almost 39 million, there are still many workers who need a raise. The Fight for $15 scored another major victory when the University of California (UC) system introduced a plan to raise full-time workers to a $15 per hour minimum wage by 2017. This was a result of tremendous grassroots pressure from labor unions and the growing momentum behind the Fight for $15 in California. San Francisco passed a $15 minimum wage in 2014, followed by Emeryville, located near Oakland, this past June, which raised its minimum wage to $16 by 2019. 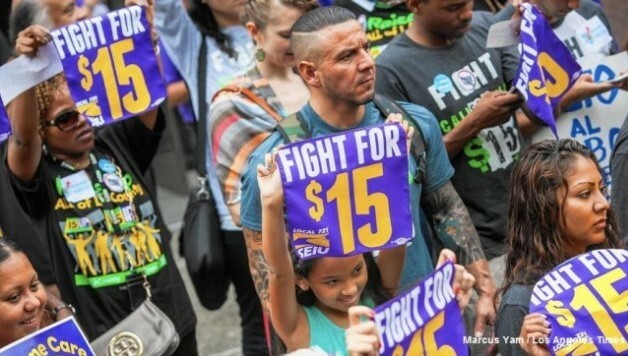 A $15 minimum wage may be on the ballot statewide in 2016, as the Service Employees International Union (SEIU) has submitted a potential measure that would bring $15 by 2021. Though not as strong as San Francisco’s measure, it still goes further than a current bill in the California legislature for a $13 statewide minimum wage by 2017. The most impactful development has been in the city of Los Angeles, where a path to $15 was won in June, raising wages for over 800,000 low-wage workers. This was followed by a similar resolution for Los Angeles County in July.